The Alcoholiday Insta Party line is the party box you've been looking for to make your boozy holiday party a hit. A mixed metals palette of silver and gold, this chic holiday party is as gorgeous as it is festive. These designer-curated party sets will make you an admirable and effortless host in an instant. Styled to perfection and totally social media worthy, you and your guests are sure to be snapping and sharing! Serves a party of 8. Select the Alcoholiday Insta Party size you need for your occasion and watch your party come to life with ease! Just add booze...and maybe some food and friends, too. Serve up a holiday party in no time with this booze themed holiday party box! All the party supplies and decorations you need are in one festive box. The best part? Our Insta Party collection of party supplies ships same day! 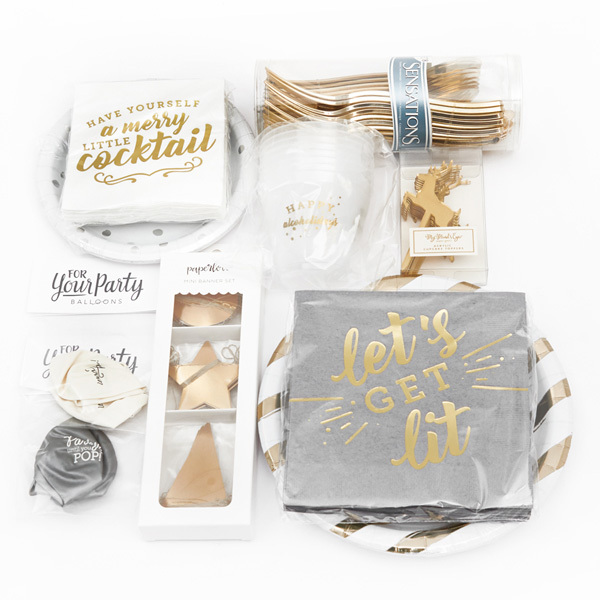 FYP's Alcoholiday Insta Party boxes are all stylishly designed for a holiday party with a fun cocktail theme. This party in a box is the best of every holiday party detail—you'll be snapping pics all night long. Your Christmas party supplies are all here in one easy-to-use party box. 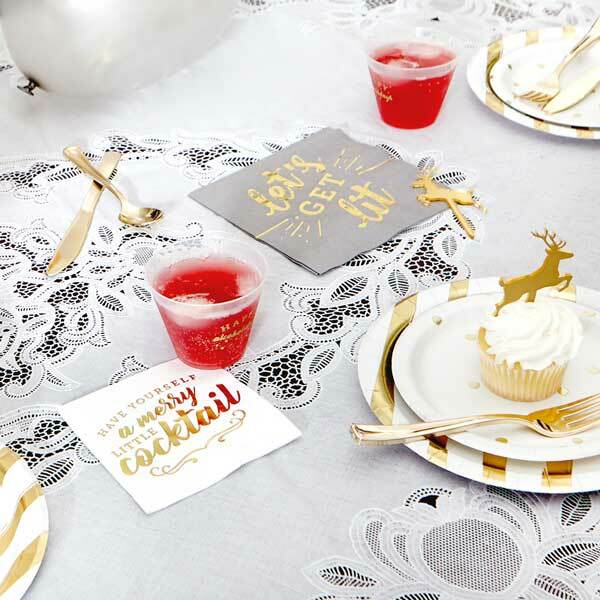 With foil stamped holiday cocktail napkins, holiday luncheon napkins and even holiday plates and cups, you can set the entire table from one party box. Don't forget the gold plasticware and metallic gold party banner. 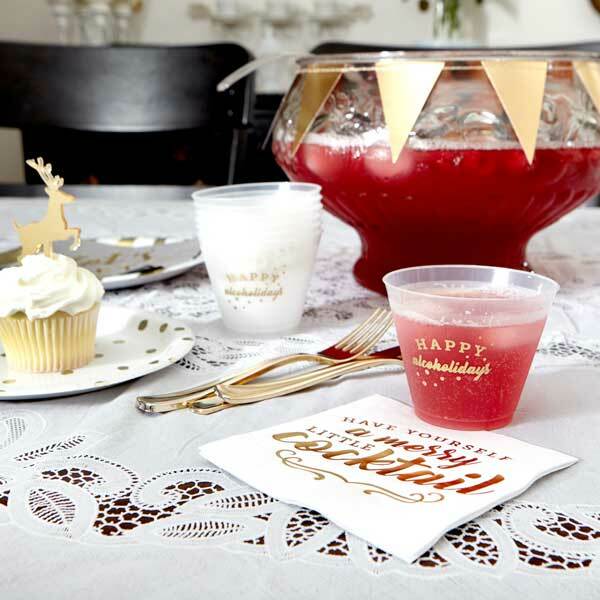 Guests will adore the fun "Have Yourself a Merry Little Cocktail" pun and you can rest easy with a party set that includes festive party supplies and the perfect holiday decorations, too. Looking to host a smaller holiday occasion? You can also choose a scaled down party in a box by selecting our Cocktail or Dinner Alcoholiday Insta Parties. Whether you're hosting your office Christmas party or looking to wow friends with a fun holiday party idea, you'll love the ease of the cocktail themed Christmas party supplies and decorations. 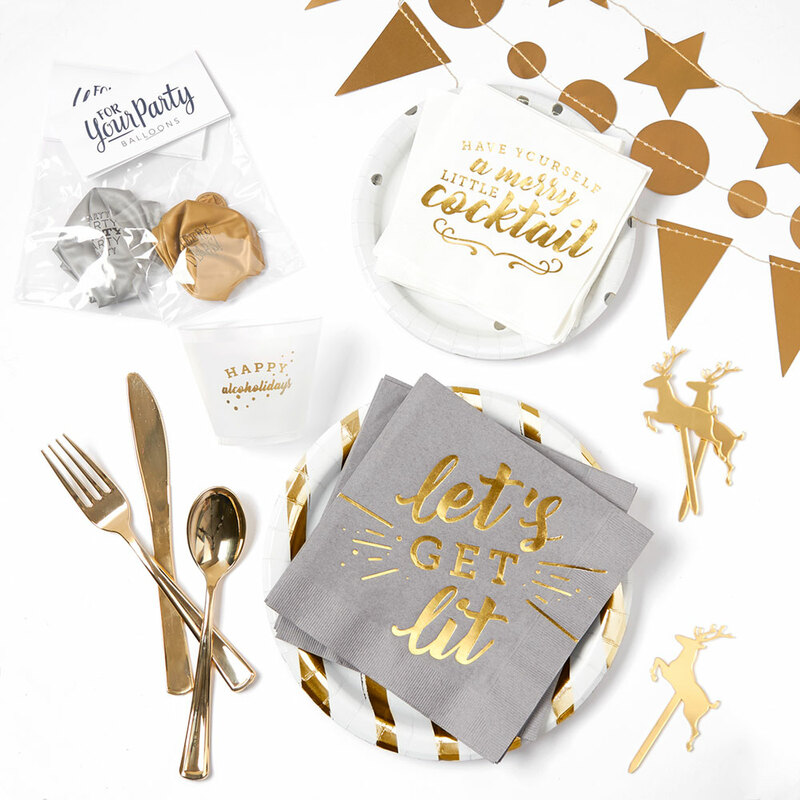 Our stylish party sets and same day shipping will make you an admirable and effortless host in an instant! Napkins, plates and plasticware are disposable and NOT microwave safe.